At Caliber, we measure public perceptions of hundreds of companies around the globe on a daily basis, which helps us understand how companies can build trust and improve business results. This time we took a step further and looked at how industry sectors are perceived, as an average of the scores given to companies within these sectors, in 13 different markets: Brazil, China, Denmark, Finland, France, Germany, Italy, Norway, Poland, Spain, Sweden, United Kingdom and USA. The results came as a surprise to us, questioning some of the old stereotypes and revealing new tendencies. As expected, the industry sectors that are most trusted and liked by people worldwide are the ones deemed closest to consumers’ hearts: from toy manufacturers to FMCG companies, these sectors include some of the most loved brands the world over. While these sectors are becoming increasingly scrutinized for their impact on people’s health, the environment and society at large – they are still viewed positively, probably thanks to their relevance to people’s everyday life, and their ability to continuously meet the ever-growing expectations and wishes of their stakeholders. One sector that stands out at the top is Medical Devices – a curious phenomenon which we’ll come back to. In the other end of the spectrum we find the usual suspects – the “greedy” banks and insurance companies, the “rip-off” telecoms operators, logistics companies seen by many as “offering nothing but late deliveries and terrible customer service”, and the “environmentally harmful” energy suppliers. These highly-regulated and little-loved sectors have been struggling with negative perceptions in most countries for many years now, but we did find some cases of individual companies belonging to these sectors that manage to distance themselves from the pack and outperform their peers reputationally. There were not enough of them, though, to lift the sectors’ average performance. In the middle of the ranking the density of results is quite high, and we find ten industry sectors – from Construction to Automotive – within a narrow range of roughly 5 points in the Trust & Like Score. 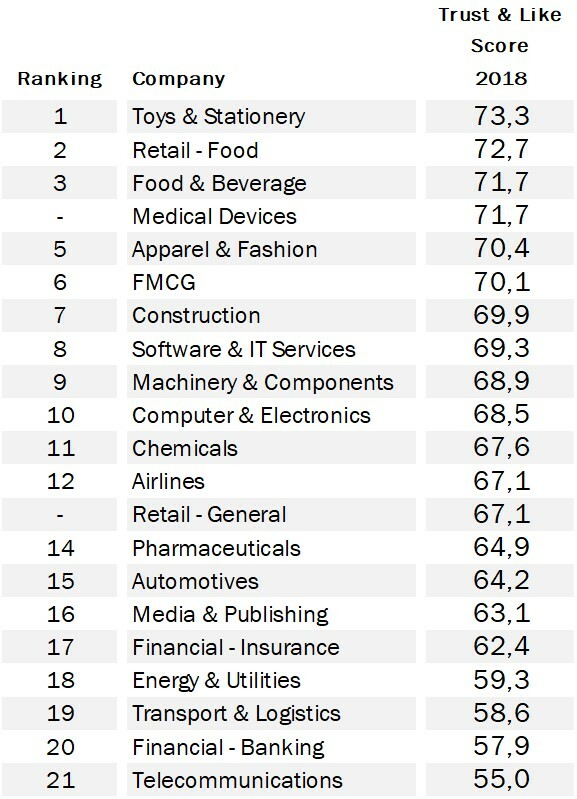 Here we see Machinery & Components right next to Software & IT Services, and Airlines sharing the rank with General Retail. As opposed to the top and the bottom of the list, the middle section is much more diverse, including both B2B and B2C sectors; infrastructure and heavy industry rubbing shoulders with the lifestyle and digital worlds. Why is that the case? Well, there seems to be an interesting phenomenon at play: previously-loved sectors like automotive and tech are increasingly losing their shine due to scandals relating to data privacy and environmental impact, or the overall public sense of amassing too much power and using it negatively. These sectors are becoming less trusted and liked and therefore drop to the middle of the ranking – where they meet other “grey” industry sectors that have traditionally been placed there due to the lack of public interest on one side, and the relative obscurity on the other side which spares them scrutiny and downright dislike. So it ends up being crowded in the middle, but not always for the same reasons. The biggest myth-busting conclusions emerge when comparing sectors that are thematically related, but are still positioned in different parts of the ranking. Medical Devices is ranked 3rd, while Pharmaceuticals is much further down at #14. Chemicals is ranked 11th (not far from the Apple’s and Samsung’s of the world ranked #10), while Energy & Utilities is at #18. Construction is placed in the strong 7th place, while Transportation & Logistics are scraping the bottom of the barrel ranked as the 3rd worst-performing sector. This illustrates two things: on the one hand, there are no longer sectors that can consider themselves immune to scandals and scrutiny, and all need to continually focus on winning and maintaining public trust and affection. On the other hand, and this is very positive news indeed, it does in fact seem possible, even for those industries that historically have had troubles with public trust, to rise up the reputational ranking and secure a license to operate from society. The excuse of being part of a sector that people “love to hate” is no longer valid. There are no wrong sectors, just wrong actions and companies that misunderstand public and societal expectations. The way to winning public trust is tougher for some than it is for others, but with the right focus and consistency, every organization can do it. The results are based on Caliber’s real-time tracking study in 2018, that measures public perceptions of the most prominent companies in Brazil, China, Denmark, Finland, France, Germany, Italy, Norway, Poland, Spain, Sweden, United Kingdom and USA on a daily basis. The scores underpinning the ranking are based on the average responses to 2 separate questions presented on a 1-7 scale: to what extent respondents trust and like each company. The scores are then normalized into a 0-100 scale without any weighting or adjustments. The annual industry results are based on more than 140.000 evaluations coming from more than 35.000 unique respondents, representing the population in the researched countries along key demographic indicators. 211 unique companies were measured in the study underpinning this ranking (companies that are measured across several markets are only counted once). As the data was collected on a daily basis throughout 2018, rather than at a specific point in time as is often the case in comparable studies, results can be seen as reflecting all events, news and activities that occurred throughout the year. All results shown can be further broken down by age, gender, geography and professional segment, as well as into specific company scores comprising the different industry sectors.